Chiropractic is a safe and effective treatment of natural healthcare. Accidents, injuries, stress or overexertion can cause your body to fall out of its natural alignment. When spinal or extremity joints become restricted, your nerves become irritated, causing pain and other health problems. Chiropractic involves the science of detecting these abnormal joint restrictions and restoring proper joint motion and neurological functioning through the chiropractic adjustment. At the Jachimek Chiropractic Clinics, chiropractic care is provided by experienced doctors who have over 30 years of experience. Our medical doctors are board certified and board eligible doctors of internal medicine that will evaluate your injuries and provide you with the proper prescriptions to promote healing and pain relief. Our goal is to provide a supportive environment and treat our clients with the utmost care and professionalism. 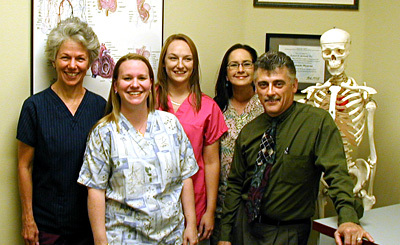 Our licensed massage therapist and clinic staff are friendly, helpful, and courteous. We are experienced in legal cases if you have or need an attorney.